By becoming familiar with the Pindify platform, and utilizing our different tools and strategies, you can start confidently inviting your most loyal fans to subscribe to your premium content. We call these subscribers, “Supporters.” And we want them to enjoy the show! We want to give your audience a warm welcome. Get inviting and get engaged! Your fans have gotten you to where you are right now. Your fans are the reason you will go even further. This is why you joined Pindify – to share your most exclusive content and your finest artistry with your most loyal fans and supporters. These are the fans who will help you build your community on Pindify, share your content with their network, and help you gain more exposure as a Provider. This guide shows you how to get your first 100 supporting fans and convert them into active supporting members on Pindify. Now that you have created your Pindify account, it’s time to start building your portfolio by uploading content and inviting your fans to become Supporters. Planning a content strategy will help you get the most out of Pindify. First, learn which content is supported on Pindify on our Help page. Second, plan on how to get your fans on board. Build a following through third-party social media channels. Create and share exclusive content to Pindify. Customize your Pindify profile with promotional and behind-the-scenes content. Decide on a content posting schedule. Building a community is like a snowball rolling down a mountain: you might start small, but you’ll get bigger quickly. It’s time to get the snowball rolling and invite your Supporters on board. This process picks up exponential speed if you already have an active following on social media. Content creation phase – just a reminder that the content creation phase is very important for your success on Pindify. You need to create a complete content profile on Pindify, together with posting at least 2-3 times per week. Like any ambitious goal, your Pindify garden requires tending, in this case through unique and exclusive content. Try posting every day for a month for the best results! First 100 followers on Pindify – The most exciting part when it comes to building your presence on Pindify will be to recruit your first 100 members. Compared to when you got on Facebook, Instagram, or YouTube, you are now looking to interact as much as you can with your closest circle of fans, the ones who will lead the way for the rest of your fan base. So make sure you have a lot of activity going for them. That’s how you will get them to contribute. Sharing among superfans – The time for when you start seeing the real value with Pindify is when your fans are sharing their great content finds on your Pindify profile with each other. This will happen once you’ve learned what they like to have from you. A great way to get to know your fans better is using our insights tool displayed on the left here. How to create the perfect content for Pindify. Pindify is the place where your most loyal fans get the chance to engage and interact with you. They get to experience unique content they haven’t seen and your moods behind the scenes. This is why you need to dig deep and find what you have not shared before. This could be content that you found too niche for basic social media. Don’t be basic. Show off the creation process – Share snapshots or stories of how your media and entertainment content was created. Think of it as the director’s cut! Content that never was released to the public – All of us have creative projects that we never had published. Fans like hearing the B-sides. Blow off the digital dust. Crack your knuckles and get cracking. Other special interests – Your super fans want to know everything there is to know about you. They want to bond with you over other topics such as your special interests. Let them feel the love. Once you start getting a picture of what type of content is gaining the most momentum, start building your Pindify portfolio. Collaborate with and invite other Providers to Pindify. 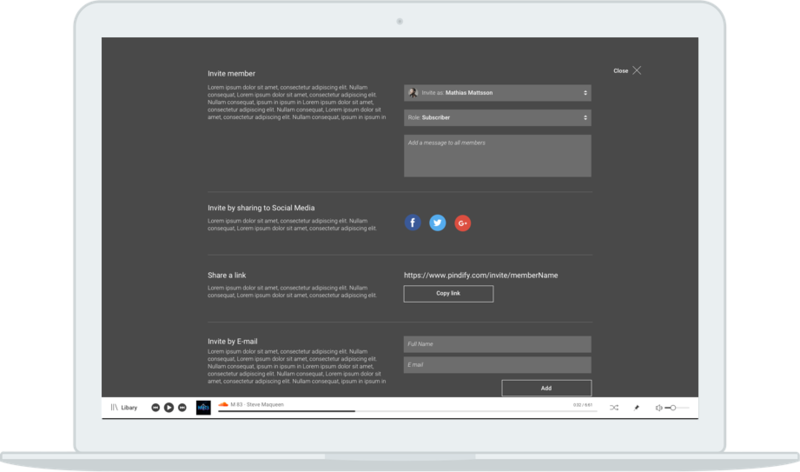 You can share earnings distributions and inviting collaborators will introduce new fans and Supporters to Pindify. You should have published content before you invite your fans to Pindify, but remember, that your key to success is to continuously share content on Pindify. Don’t play all your cards at once. • Promotional pictures makes great story cards if you add a interesting caption to them. Tell the story behind when they were taken, straight up! • Semi-live updates from when you are on the go, recording, writing or having a show. • Video clips do not need to be only 15 seconds long on Pindify, as they do on other social media platforms. Take your time. Even a video with you improvising on your phone will be a great success. Your super fans will love this because they think of you as an influencer within your field of expertise. Your first 100 followers - Timing and storytelling is the key to success. Pindify is the place for sharing well-written long- form content as well as behind-the-scenes updates from your life. On all digital media platforms, timing and staying true to your brand is important. These days, we all have the attention span of a goldfish. This means that a Pindify Provider has only three seconds to grab someone's attention and to engage their audience and take action. To successfully use other media channels to invite new fans and Supporters, we suggest you give a followers a taste or a “teaser” of your new Pindify projects you’re hoping to monetize. Short video teasers that link to full-length videos on your Pindify page. Behind-the-scenes images from when you're creating content for Pindify. Snapshots of outtakes or early drafts that you post in full on Pindify. As you might have guessed, it requires some work to create a fanbase on Pindify. When you have gotten your first super fans and Supporters on board it will be easier to know what they really want to see from you as a Provider. And how they would like to interact with you. After you’ve started publishing, you’ll be able to use the “Insights” tool to see what your fans and Supporters are interacting and engaging with. You can also ask questions. Until you have published a variety of content on Pindify, your super fans will want to follow you behind the scenes. Share stories of your creative process. They want to hear you talking about your obsessions and hobbies, like snowboarding, rock climbing, or hunting for vinyl records. They want to watch a master class describing your creative process. Inspire them! What we do know is that for the first couple of months, you need to be three steps ahead of your fans in order to gain momentum and move up the ranking system. We know that it might sound boring and complex to create a schedule for your content for Pindify and your other media channels, but it’s more of a way of thinking ahead than geeking out over a spreadsheet. You can be creative about it. You know who your most supportive fans are. You may even know them by name. You may have already set up regular communication with them through newsletters, your other media channels, or on Pindify. That’s awesome! What you need to do now is ask them for their help, and provide them with content they can't help but share. What would make them share? Unique and newsworthy content that will give them status among their peers in their community. News that they believe that will help you forward. They’ve invested a lot of time in your work – of course they want to see you succeed. By inviting them to a new platform where you are publishing unique VIP access, they will know that they are important to you. One important thing: don’t forget to celebrate your followers when they do something for you. This is a great way to say “thank you,” but will also inspire other Pindify Providers that this is the way to engage. Maybe Pindify will even promote you via our other media channels as you rise to the top of the ranking. As Tolstoy famously said, happy families are all alike, and good parenting involves a lot of positive reinforcement. At Pindify, we’re family, and we want to be a high-functioning one—built around shared passions and monetary success! We answer many troubleshooting questions you might have in our FAQ. If you still have questions, don’t hesitate to visit the Contact and reach out! This part is all about how you make a living on Pindify. Follow this guide and maybe you can quit your day job.